Greetings from Cutler County is both a nonstop ride of tragic hilarity, and a piercing look at the complexities of youth. In one northern Michigan community the lives of desperate small-town dreamers are examined through an ensemble cast as earnest as they are outrageous, and as compelling as they are heartbreaking. The lovers, crooks, failures, and survivors of Cutler County are so flawed and genuine you can't help rooting for them—no matter how foolish or hopeless their pursuits may seem. 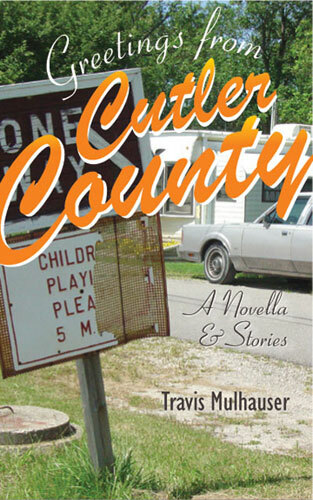 The stories take place in Cutler County, Michigan. Most of the characters are young men who think of themselves as losers and outsiders. Short on cash, popularity, and the ambition needed for success, they nevertheless are able to examine their failings with the self-knowing humor and resignation of the perpetually thwarted ne'er-do-well. The stories are inseparable from the stark shoreline of their Lake Michigan settings—the cavernous woods and vast inland lakes that shape life in northern Michigan—and create a landscape as rugged and dramatic as youth itself. Greetings from Cutler County explores the common triumphs and tragedies of coming of age, while providing a rationale and humor that is uniquely and unforgettably its own. "Travis Mulhauser's stories manage to be at once wooly and sweet at heart. They also manage the admirable but rarely-obtained feat of realistically evoking hard living in the tarnished beautiful American heartland while revealing the possibilities for redemption and perseverance. Mulhauser's ear is dead-on and vibrant, his people are loveable, maddening and unforgettable, and I am telling everyone: this book is the truth." ​"Mulhauser crafts fabulous stories about captivating characters---dreamers, romantics, philosophers, strugglers. In short, he renders humanity, and renders it marvelously." " . . . his stories hit the mark in their attempts to portray the juxtaposition of youthful enthusiasm with the claustrophobia of small-town living."